There’s a lot that’s wrong with this country. We have the highest medical costs combined with some of the worst outcomes; one of the highest rates of infant mortality among the industrialized world, and also one of the highest rates of death in childbirth for women. We have the largest and most expensive military in the world, and by any estimate, we are one of the most war-mad nations on Earth. We currently have active duty military personnel stationed in 150 countries around the world. Our education system is inefficient where it is not simply ineffective. As a country, we don’t read. (So really, I’m not sure why I’m writing this.) We have a biased and often irrational media, run by a steadily shrinking number of corporations and consumed by a shrinking minority of the people. Wealth and income disparity have been increasing, and our rates of poverty, childhood poverty, and especially food insecurity have been increasing steadily for decades. We also, not coincidentally, have the largest and most expensive prison system, with the greatest number of prisoners of any country on Earth – over 2.2 million adults incarcerated, with another 5 million on parole or probation. And even fifty years after the civil rights movement, every one of these problems is worse for minority populations than it is for white citizens. There’s a lot that’s wrong. But despite all of that, there is one thing, at least, that we do right, and it’s more important than all of these: this country is still a democracy, where the votes of the citizenry select our leaders; where we have the power to elect, and to remove, essentially anyone in power over us. If and when the people of this country develop the political will to tackle any or all of these problems, we are the ones who have the power to do so: we set the agenda, we determine the government’s size and shape, and we choose its priorities. The only thing stopping us from at least trying to deal with these issues is ourselves. And that means that perhaps the worst problem this country faces is this: only about 50% of eligible voters actually cast their ballots in an election. In Presidential election years, it’s around 60%; in midterm elections it’s about 40%; the rate is lower for local and special elections. The primary happened here in Arizona this past Tuesday, and we seem to have set a record for primaries: we cracked a million votes cast. Of course, there are more than three and a half million registered voters in the state, so our record is less than 30% of the potential total. Exciting. Even though we have the ultimate power to determine our nation’s path, we don’t do it. Not that we can’t, we just don’t. The best thing about this country, and we don’t take advantage of it. So why don’t we? Honestly, there are a lot of reasons: the biggest is that people don’t think that their individual vote will matter, so they don’t cast it; that’s a tough one to overcome, too, because logically, it’s true. There has never been a serious election won by a single citizen’s vote. Small elections can build momentum for large elections, and so there might be a snowball effect started by a single person’s vote; but even an argument like this one I’m making here, trying to convince people it’s important to vote, has to rely on large aggregates of voters: if all of the citizens who didn’t vote in the last election voted in the next one, they could almost outvote the entire election, in which only 58.1% of eligible voters cast a ballot. Certainly that group of voters would have been larger than either of the groups who voted for the two major candidates. But that fact, while disturbing in the extreme, is still about millions of voters – tens of millions of voters. Nobody can argue that one single person’s vote would have turned the tide. Then there are the institutional obstacles to voting: the fact that U.S. elections happen on a workday, that polling places are limited and sometimes hard to get to, especially in rural areas; in many cases there are factors that cause voter suppression, sometimes even deliberately, such as pre-emptive removal of voters from registration rolls, or the frequent imposition of ID requirements for voting. The 2.2 million prisoners I mentioned above, along with a large number of the 5 million parolees, have had their civil rights suspended or stripped because of their crimes, often including their right to vote. I myself was disenfranchised by my state, Arizona, in the 2016 primary because even though independent voters, which is how I registered in Arizona in 2014, can vote in primary elections, they cannot vote in presidential preference elections, which is what that primary was called, when we were offered the chance to choose between Hillary Clinton and Bernie Sanders. I didn’t get to do it because of that rule and the way the state defined that particular election. Of course there are circumstantial reasons why people don’t vote: they’re busy, they’re sick, they couldn’t find a babysitter, there were unforeseen complications. When we’re talking about 100 million uncast ballots, the number of people who didn’t vote because they had food poisoning that day is probably in the hundreds of thousands. And I don’t really have a solution to offer there, other than to stay away from the clams; they seem a little sketchy. Also, gross. But avoiding bad seafood is not going to solve this problem. Of course not. However: the argument that one single voter does not change elections, while true, vanishes in the face of another truth: that the 100 million votes, which are more than enough to swing the last election in any direction at all, are made up of individual, insignificant votes. There is little significance in a single vote, but there is nation-shattering significance in the 100 million votes – and that means that each of those votes contains a small amount of that earth-shaking power. Getting people to stay away from shellfish wouldn’t change a national election; but it would change (I’m assuming) some number of potential non-votes into votes: and in conjunction with everything else we might do, it might just change enough non-votes into votes to actually change the election, change the government, change the country: change the world. So seriously: stay away from the clams, for at least a couple of days before the election. In thinking about all of this, particularly while reading the President’s Twitter account, where he stumps for every Republican candidate he can think of, and also in my disappointment over the blue wave here in Arizona in the primary this week (The turnout may have been record-setting, but there were still only about 400,000 Democrats who voted, compared to over 500,000 Republicans. That’s not a blue wave, that’s a red splash with a blue ripple. ), I thought of one small factor that, by itself, may not amount to much, but I think does have an impact on election turnout. Maybe even as much as the clams do. And if it isn’t directly causative of non-votes, it does, I think, have some influence: and it’s one of those things that would be easy as well as beneficial to change, in ways other than the effect on voter turnout. Also like avoiding clams, which is good for health and also because they’re gross. The factor is this: our first impression of elections. We all know that first impressions can make a difference. They don’t always, and even in the cases where they do, subsequent interactions can entirely overwhelm that first impression: my wife’s first impression of me was that I was cute but dumb; then she thought I was an arrogant jerk; and then she realized that I was cute but socially awkward. It’s the third impression that found the truth – though there’s a pretty strong argument for that first impression, I’ll admit. (And probably for the second.) I almost lost my chance at my favorite college job, my position as a custodian at the Civic Auditorium, because my initial interview gave my boss the impression that I could not work with managers – my application said that my previous two jobs had ended because of personal conflicts with management. Fortunately, they listened to my explanations of those personal problems (In one case, the management was badly mishandling the clientele, and I couldn’t abide it; and in the other case, the manager had a crush on the very beautiful woman who is now my wife, and resented that she made it all the way to that third impression of me and the dates that came afterward) and gave me a chance, which led to my five years of work for the Civic. But those first impressions mattered. I have two examples where a bad first impression was overcome, but that’s because I don’t remember most of the situations where I made a really bad first impression: because those first impressions led to – nothing. Those are the dates I never went on, the jobs that never even called me back. There are more of those than the other kind, for me as for all of us; and first impressions have a lot to do with that. Those votes, in this argument as in life, don’t really count. No: the first place we encounter actual voting for actual elections, on a smaller than national scale, is in school. When we elect student council officers. That, I would argue, is our first impression of the democratic process in this country: and not only does it give us a bad first impression, but it’s also an accurate bad impression, because the things that are wrong with student body elections are also what’s wrong with our national elections. First of all, there are the candidates. For every serious student body candidate, for every student who wants to do a good job and help out the school and the student body, there is a goofball who runs because they think it’s funny, and at least two candidates who run because they want the attention, they want to win for the sake of winning, they want to put “Student Body President” on their resume. And so it is in our national elections: for every Barack Obama, John McCain or Mitt Romney, there’s a Vermin Supreme, a Deez Nuts, or a Donald Trump. (Note: I don’t mean to ride Mr. Trump in this piece; but I maintain that there was nobody in this country who was as surprised by his election win as he was himself. Actually, his wife might have been more surprised.) And though Harambe, who was at the time of the 2016 election not only a gorilla, but also dead, only got a small number of write-in votes for president, sometimes, the joke candidate wins. My high school elected two very capable young men to the position of President and Vice President for three years, alternating positions between them. They were good guys; they did a good job. Then our senior year, another guy ran as a joke. He was a nice guy, but not really presidential; he wasn’t involved in student body activities, didn’t have any leadership experience, didn’t really care about school politics; he just thought it would be funny to run. And as students do around the country, the rest of us thought it would be funny as hell to vote for him, instead of the two guys we actually wanted to have as student body president. And of course, I don’t have to tell my fellow American citizens, he won. And I will say he took it on, tried hard, and did a decent job; but the lesson to be learned is – well, it’s one we clearly haven’t learned as a country, because people wrote in Harambe. I would argue that it’s student body elections that teach us to vote based on humor and irony, rather than considered and rational opinions. Speaking of Harambe, one of the student body elections at the school where I now teach featured a poster that made a joke about Harambe, and who he would have voted for had he not been killed. There’s another aspect of elections where student body campaigns echo, or foreshadow, national elections to the detriment of our democracy: because student body election campaigns, even more than the candidates, are a joke. The kids slap up some homemade posters, heavy on the glitter; they make a single speech, usually during lunchtime; and then people vote. That’s not a campaign, that’s a plug for a would-be You-Tuber: Click like and subscribe if you enjoyed this poster, if you laughed at this speech. There aren’t any discussions of issues or causes, no proposals made other than the most basic; student elections are pure identity politics, nothing but a popularity contest. If people don’t vote for their bestie, then they vote with their sense of humor (if they’re not voting for the cutest candidate, that is.). How does that prepare us for a substantive debate of the issues, for an election that will help set the course of our entire country for some number of years? It doesn’t. It does help to prepare us for elections that run entirely on attack ads, negative campaigning, gotcha media strikes, manufactured scandals, and of course, partisan politics, where people vote for their team and not for the other team for no other reason than that. And look: that’s exactly what we have. Again, I’m not trying to argue that student body elections are the cause of our current madhouse of a democracy; but first impressions do matter. We see trends in student body elections that recur in national elections, and unless those flaws are inherent in the system, inborn in us and therefore inescapable, then what this repetition shows us is that we vote as adults in the same way and for the same reasons that we vote as children. So the question is, why do we vote that way as children? I think it’s mostly cynicism and despair, honestly. As students in school, we are all too aware that we don’t control things. That the student body president, even if we elect one that is after more than a bullet point on a resume, is really not much more than a bullet point on a resume. That the aspects of school life that are controlled by the elected student officers are not the important aspects; that they are ceremonial, maybe even just distractions. Like a president who gives speeches, who hold press conferences, who streams out comments on Twitter, but who doesn’t really do much of substance to change the lives of ordinary citizens, certainly not on his own. We know it as students, and we suspect it as adult citizens, and so the natural response is to either vote as a joke, or to not vote at all: because to participate sincerely is to get played for a sucker. “You thought this mattered?” our fellow says, and rolls his eyes at our naivete; rather than face that, we write in Harambe. We go to work, or stay home, rather than drive to the polling place on the second Tuesday in November. Just like we did in high school. I said “we” elected a pair of nice young men as our student body president and vice president for three years, but that was a lie; I never voted in those elections. I never cared. When it comes to national elections, that indifference, that desire to avoid looking a fool, is wrong. Elections do matter, now; votes do matter. In high school, they probably don’t: and therein lies the solution I’d like to suggest. Because just like fighting the influence of bad clams, I think it is at least possible that student body elections help to suppress at least some votes, because people who go through elections that don’t matter may not care enough to vote in the very next election available to them, which may be a national election the November after they graduate high school – or even while they are still in high school, if they are 18 their senior year – and if they don’t vote in that one, they may not vote in the next one. I think that probably happens, and when we’re talking about 100 million non-voters, it may happen hundreds of thousands of times. Here’s what I propose. I say we make student body elections matter. Doing so would be simple, and would actually have a number of benefits: all we have to do is make student leadership positions matter. We have to allow student council members to have real power. They should win a place on the school board. They should have a seat in administrative meetings, at least ones that don’t relate to confidential matters. They should actually be able to speak for the student body, in some way that genuinely matters at the school. If the position was more than a ceremonial sash, then the elections would become more serious, almost instantly. The students would care who was representing them if that representative could actually make a difference in their lives; and in a high school, that is not only possible, but preferable. There are a large number of aspects of daily high school life that don’t matter much to the adults in the room, but matter quite a lot to students. Like the dress code. Like the tardy policy. Like off-campus privileges. If a student body president could actually fight for and win those privileges, then students would elect a president who could do those things, and they wouldn’t vote for Harambe. Doing this wouldn’t just change the votes and the elections. It would also change the leaders: it would prepare those students for positions of larger responsibility. It would show all of the students that elected leaders can and should make a difference in the lives of their constituents. It would show all of us that democratically elected leaders can have some impact, despite the Powers That Be looming above and behind them. It would also make public schools more responsive to the will of the student body, which, I would argue, is sorely needed all on its own merits. I’ve watched my school grow more and more autocratic and dictatorial, for no reason other than they can and because they don’t care how the students feel about it; I’ve watched my students grow more angry, and also more cynical and hopeless about it; and then I see my fellow Americans. I see 30% voter turnout. I see candidates like Joe Arpaio, the 86-year-old convicted felon who ran for Senate in Arizona, and pulled in over 100,000 votes – ten percent of the total, almost 20% of his party’s total votes. I see that, and I wish those people had written in Harambe. But really, I wish to find a way to change these trends, to make our elections and our democracy into what they should be. And though I don’t think I can stop people from eating clams, I think I might be able to get them to make a change in high schools. We can, and we should, for all kinds of reasons. There’s a lot that’s wrong with this country: let’s make this one right. I bought this because Jack Finney wrote Invasion of the Body Snatchers, which is a science fiction classic, and one of my all-time favorite short stories, Contents of the Dead Man’s Pockets, which is just brilliant. Also, my copy of this is from the Fantasy Masterworks series; and, last but not least, it’s about time travel. I wrote a book – two, now – about time travel. Clearly I need to read this fantasy masterpiece by an excellent author about a theme similar to mine. Now I’ve read it; I’m not sure I really needed to read it. The book is the story of a government project to realize time travel. The concept is deceptively simple: based on Einstein’s theories that time is similar to space in that it is a dimension of the space-time continuum, which means it has an axis, and therefore just as you could move in either direction along one axis in space (up-down, right-left, forward-back), you should be able to move in both directions in time. I don’t want to get too far into it, but the government project is, I think, quite well done: they do things the government would do, in the way that government would do them. The main character is a graphic designer and illustrator living in New York City in the 1960’s or so (The actual date of the modern era is left vague), who eventually attempts to travel back in time to 1882. The key is to find a space that can be isolated from the modern era completely: in this case (though there are several different attempts going on at once), the central element is the Dakota, a residential apartment building/hotel in New York City that has remained unchanged from the 1800’s until now. It’s a clever idea, honestly, and Finney does it really well. There are some things about this book that are incredible. The level of detail that Finney was able to summon and wield in order to capture the time frames, both the character’s starting point and the destination, is amazing. The world he describes is lovely, but not actually idealized – one of the very best scenes is a conversation the hero has with a wagon driver in 1882 who describes what absolute hell it is to have his job in the New York winters, and it’s a brilliantly dark moment – which just made its loveliness more impressive; reading the book feels like being nostalgic for an era that I never knew, and a city I have visited but never cared too much about. As much as anything else, this book is a love letter to New York City: the comparison between the Big Apple of the past and the modern one makes both cities seem glorious, from Central Park to St. Patrick’s cathedral to Madison Square, from the Museum of Natural History to the Dakota building to the Statue of Liberty. It’s all wonderful. The descriptions are specific and detailed and interesting, and Finney made liberal use of original photographs and drawings from 1882 New York, making his main character into an artist as a means of drawing the actual historical art into the narrative. Some of the reproductions in this paperback edition were a bit sketchy or blurry, but it did certainly bring the setting to life, and I loved that. You know what I didn’t like, though? The characters. Not a one of them. The main character, Simon Morley, struck me as an arrogant putz, and they went downhill from there. The best people are the cast of characters in the past, but several of them are, as you might expect, a little too alien for me to relate to very well; I suppose I can appreciate gathering with the other roomers in my boarding house to sing songs together in the drawing room, but I can’t help but think it strange, too. You know what else I didn’t like? The plot. The major conflict is resolved in the first 150 pages (of 400) when – spoiler – time travel works. After that it’s Simon Morley putzing around, making bad decisions and then following them up with worse decisions; it does, I admit, make him realistic, because I think most people would do a lot of the things he did – but they were stupid things to do, so I can’t like him for it. I do like his final decision, which I will not spoil here but which did surprise me; unfortunately, it made reference to an earlier detail that I had forgotten entirely, so the poetic denouement was lost on me. Part of that is because the book took me a long time to read: a slow plot and annoying characters, combined with the start of the new school year, dragged this one out for a couple of weeks, which is a long time for me. Don’t let me ruin this one, though. The time travel idea is interesting, if in some ways far fetched (Yes, as compared to the far more realistic means of time travel from other books – like mine, where it is, y’know, magic. Reality squared, that’s what that is), the writing and the descriptions really are remarkable, along with the photos and the historical details. It’s a good book. 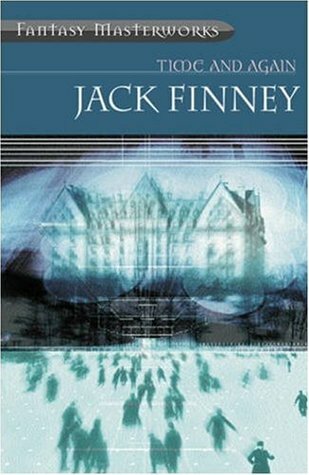 I just wish Finney had written a better hero.